The female of the couple thought my wife had said that we were going "laser camping in the salt". This was, at the time, very funny. It has stuck in our memory, and the Beer Model and I still use the term whenever we talk about visiting the Great Sand Dunes. You will see it referred to a bunch on the Great Sand Dunes label of this blog. You may remember that Laser Salt Sandy Blonde Ale was the beer that the Beer Model and I brewed together to take on a group camping trip to the Great Sand Dunes. See Brewing the Laser Salt. Laser Salt was the first beer in which I used White Labs' "Clarity-Ferm" to make the beer "Gluten Free" Actually, technically, "Gluten Reduced" is what I should call it (see Killing the Glutens). GABF is coming up and the gluten-sensitive friend "Gretchen" mentioned to me not too long ago that she would like some more of "that Gluten Killer". This batch will be ready and should be in about its aging sweet spot around the GABF to give as a Thank You for taking our kids that weekend. Much better than our insensitive beer gift last year (see 2011 #GABF Final? Thoughts). 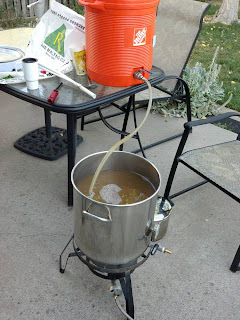 So, I decided to brew up another batch of Laser Salt Sandy Blonde Ale this past Sunday. Just like last time, I did a double infusion mash. This time, though, I correctly did the math on the first infusion to convert 12 quarts to 3 gallons instead of 4 gallons. I did over-shoot the temp on the first infusion and got closer to 140 than the planned 131. So, I'm not sure I got a proper protein rest. I could have added ice to adjust back down, but I just left it. I don't think it will be a big deal. I hit the second infusion perfect. My saccharification rest was right at the planned 154 for the whole time. I left it in this rest for a bit longer than the planned 30 minutes. My mash efficiency was a bit lower than usual, and I corrected with a few ounces of DME. I don't know if this is a function of the double infusion, or just a coincidence, but I think all my double infusion mashes have had lower efficiencys. That is not really a big deal. But, I am not sure the extra step is actually doing anything for me. I may just go with a single infusion on this beer next time. I actually got the mash done and the wort all in the pot before church. 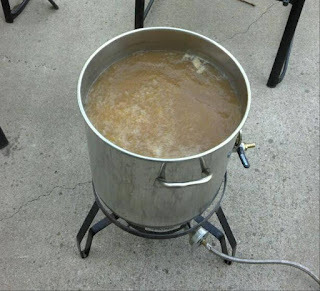 When we got home from church, I was able to just start up the boil. The boil was uneventful. I added the bittering hops "free" and the flavor hops in a large hop sack. bath. Like I did for the last couple of SheppyBrew batches, I put the carboy in the Gott cooler with ice to cool it the rest of the way and was able to pitch at 58 degrees. 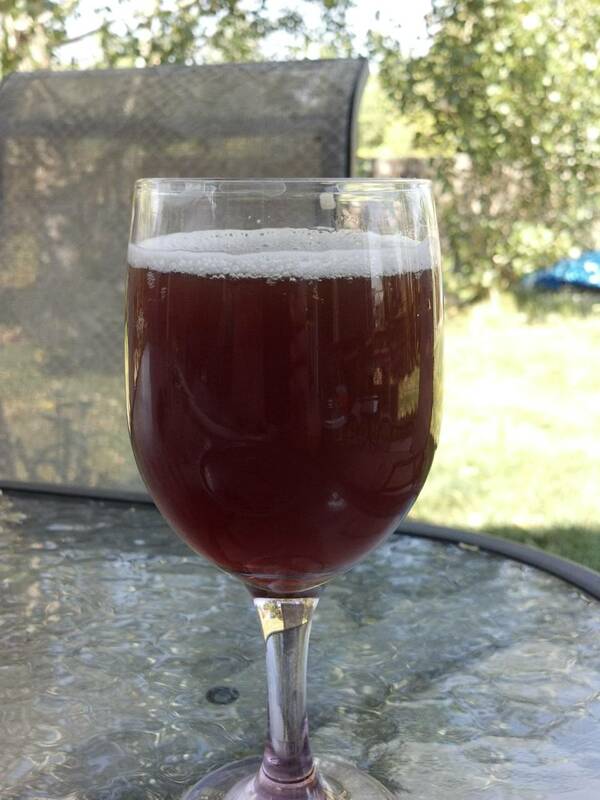 I almost forgot to add the clarity ferm, but got it in 15 minutes or so after pitching the yeast. Fermentation started up very fast. It is now Thursday, and the main fermentation seems about done. I'll leave it in the fermentor for the usual 2 weeks. As always, if you have not followed one of the links above, you can see the recipe on SheppyBrew.com (Laser Salt Sandy Blonde Ale). Let me know if you have any questions / comments / concerns. Thank you and have a nice day. Go Bears!